This week, MeldaProduction offers 50% off a new selection of four plugins. Harrison Consoles offer Mixbus 3 owners a special plugin package at reduced price. The Plugin Alliance has chosen Unfiltered Audio's G8 as their "Plugin of the Month", making it available at discounted price all through February. A month after Lindell Audio, Plugin Alliance again enriches its catalog with a new brand: Unfiltered Audio. Alex Hilton provides us with his vision of the sequenced gate with a new free plug-in for Mac OS X and Windows. 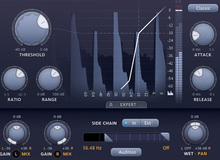 Bob Perry Audio is a young team of developers who introduces two VST 3 audio processing plug-ins, one of which is free.